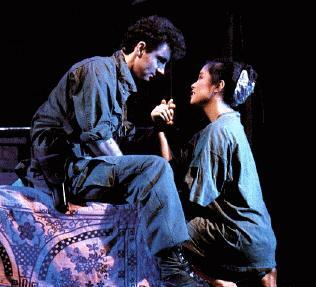 From the writers of the epic ‘Les Miserables’, Claude-Michel Schonberg and Alan Boublil’s musical Miss Saigon took the world by storm after premiering in London in 1989. After numerous worldwide productions including a successful run on Broadway the show is one of the world’s most recognised pieces of musical theatre. The harrowing story, memorable score and groundbreaking production values helped the show become a critical and commercial success, and it continues to pick up awards and break records in various new productions. Original producer Cameron Mackintosh is now bringing the show back to the West End in 2014, where it will play at the Prince Edward Theatre. The original production opened at the Theatre Royal Drury Lane where it currently holds the record for the venue’s longest running musical, clocking up over 4,000 performances. The musical is based on Giacomo Puccini’s opera ‘Madame Butterfly’ and follows the same emotional story of a native woman falling in love with an American soldier and giving birth to his child before he leaves her at the end of the War. The action is updated to the Vietnam War in the 1970s, and Puccini’s Japanese Geisha and American Lieutenant become a Vietnamese prostitute and an American GI. Parallels between the two stories remain constant throughout the show, and the emotional journey felt by the lead characters becomes easier to relate to. The show inspired later musicals that were also based on Opera’s such as ‘Rent’ (1996), based on Puccini’s ‘La Boheme’ , and Elton John and Tim Rice’s ‘Aida’ (2000) based on Verdi’s opera of the same name. After the controversy of the War in Vietnam, many audience members are able to relate to the updated story, not just on behalf of the lead couple but for the thousands of ‘Bui Doi’ who were left behind in the war-torn Vietnam. Boublil and Schonberg were inspired to write the musical after coming across a photograph of a Vietnamese mother giving her child over to a US army base to take them to live a better life with their ex-GI father in America. 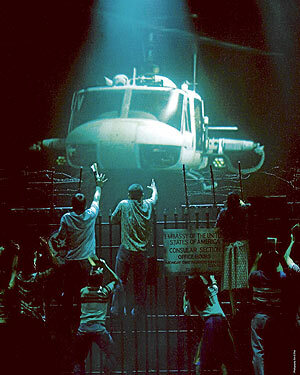 This idea of the “ultimate sacrifice” shows the war from the perspective of the civilians, which is a key theme throughout the musical. Propaganda photos that were used throughout the Vietnamese war helped drive the creative team to write a show that dealt with the human feeling on both sides. The London production opened at the Theatre Royal Drury Lane on 20th September 1989 where it continued to run until 30th October 1999. The show arrived amidst the rise of the ‘mega-musical’ in London, behind which producer Cameron Mackintosh was pulling the strings. London audiences were in awe of heightened production elements, with shows such as The Phantom of the Opera, Starlight Express, Les Miserables and Cats raising the bar for what theatregoers were expecting. With a huge venue to fill, designer John Napier created one of the most technically impressive set designs to ever be seen in the West End. Over 250 people were involved in each performance, with 50 actors onstage bringing the epic story to life. The statue of Ho Chi Minh was almost 18 foot high, with other set pieces weighing over a ton. A Cadillac car was made specifically for the production, used throughout the American Dream sequence which also used 300 dollar bills per performance. The highlight of the production for many people was the helicopter that landed on top of the US Embassy and took off again each night. Napier’s illusion was widely talked about, and although the designer admits the effect was simpler than it looks, using thin chords with weights to give the effect of the rotating blades, audience members raved about the dramatic climax. In subsequent productions, such as the recent UK tour, the helicopter was projected in 3D, and in Szeged Hungary a real one was even used in an open air production! The Musical follows a similar story to Puccini’s Opera, although a number of additional characters are created. The show opens in 1975 at the ‘Dreamland’ nightclub in a sleazy part of Vietnam, shortly before the Fall of Saigon. Seventeen year old Kim begins work at the nightclub and is watched over by the shady Engineer – a French-Vietnamese crook who dreams of a better life in the United States. As the US marines party into the night with the prostitutes, Chris is stuck by Kim’s innocence and the two immediately fall in love. As Chris tries to bargain with the Engineer to release Kim to him, the two are married in a ceremony led by the other bar girls. Thuy, Kim’s cousin to whom she is betrothed steals her away, and as Chris prepares to leave Saigon he promises he will come back to save her. 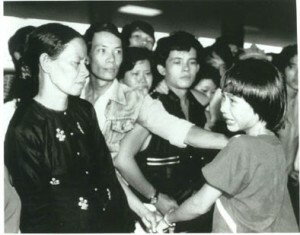 As time passes and Saigon becomes Ho Chi Minh City, Kim, now with Chris’ child Tam still holds on to hope that Chris will come back to find them. The Engineer finds Kim and takes her to Thuy, but as it is revealed the child is half American the Engineer leads them to Bangkok, hoping the child will be their passport to the USA. Meanwhile in America Chris has married Ellen, and is forced to tell her the truth about Kim and Tam as he finds out she is still alive. They travel to Bangkok with their friend John who runs an aid organisation that aims to connect children conceived in the war (Bui-Doi) with their American fathers. As they find Kim, Ellen is forced to tell her that Chris has now remarried. Kim pleads with her to take Tam for a new life in the USA, but Ellen refuses to take the child from his mother. Hoping that they can all move to America together, Kim is haunted by the ghost of Thuy who tells her Chris will abandon her just as he did at the fall of Saigon, where he climbed into the final helicopter to leave the Embassy leaving Kim watching on the ground. As Kim prepares Tam to meet his father and the Engineer’s American Dream is shattered, Kim shoots herself, freeing Tam to live with his father and live a better life. The style of music written throughout the show is similar to Les Miserables in the sense that the score is almost completely sung through rather than interrupted by book scenes. Together the atmosphere created directly represents the tone of the show, with a mixture of rousing chorus numbers and solo ballads. The instrumentation for the show includes many Eastern instruments, specifically percussion which help add to the intense atmosphere. The fusion of two worlds is expertly caught by Schonberg, who mixes the American/Western sound in numbers such as ‘The American Dream’ and ‘What a Waste’ alongside the Eastern harmonics that can be heard in ‘If You Want to Die in Bed’ and ‘Sun and Moon’. After opening the show with the softened diatonic bells in the Overture, the harsh, brash chords of ‘The Heat is on is Saigon’ blasts through, making its impact on the delicate setting, reflecting the primary action. The most popular numbers in the show, or those which have enjoyed life outside the musical, tend to be the ballads, such as ‘Why God, Why’ in which Chris questions why he has only met Kim in these circumstances. The act break ‘I’d Give My Life For You’ is a popular ballad for Kim as she sings to Tam who ‘didn’t ask to be born’, committing her future to providing the best she can for him. ‘The Last Night of the World’ is a duet between Chris and Kim, where the pair sing of a hopeful life together, enjoying the moment but lamenting the circumstances that surround them. This song is often performed in concerts and shows as it thoroughly represents the heartache felt by both characters and dramatically builds to their inevitable fate. The character of Chris’s American wife Ellen is often criticised for being cold and bitter, and by the time she is introduced half way through Act One the audience fails to sympathise with her situation. Boublil and Schonberg have attempted to rectify this throughout the music, changing and updating her Act II ballad multiple times, beginning with ‘Her or Me’, before the more sympathetically titled ‘Now That I’ve Seen Her’. The problems with Ellen’s character corresponds to Kate in ‘Madame Butterfly’ and very rarely wins any audience support, despite the quality of the actress portraying her. The original cast of Miss Saigon has become immortalised through the Original Cast Recording as well as a number of conspiracies that shook the way Actors Equity in both the UK and USA operated. From the very beginning Producer Cameron Mackintosh had a specific idea of what he was looking for in his leading characters, especially the pivotal role of Kim. The part was eventually played by unknown Filipino actress Lea Salonga, after an extensive search all over the world. At the age of just 17 Salonga impressed the production team, and went on to impress critics and audiences, winning the Olivier Award for Best Actress in the 1989-90 season. After opening the Broadway production she returned to the cast intermittently to boost ticket sales, closing the London production in 1999 and the Broadway production in 2001. RSC actor Jonathan Pryce created the role of the Engineer, in a move that upset some due to his Caucasian ethnicity. Simon Bowman starred as Chris, with Peter Polycarpou as John and Claire Moore as Ellen. In transferring the production to Broadway, Mackintosh, who by this time had overseen the commercial transfers of shows such as ‘Cats’ and ‘Les Miserables’, ran into problems with the Actors’ Equity Association. They were unhappy with Jonathan Pryce, a white actor, portraying the role of a Eurasian in America, taking the job away from the many Eurasian actors struggling to find work on Broadway. Actor’s Equity originally stated: “After a long and emotional debate, the Council has decided it cannot appear to condone the casting of a Caucasian actor in the role of a Eurasian… the casting of a Caucasian actor made up to appear Asian is an affront to the Asian community… the casting choice is especially disturbing when the casting of an Asian actor, in this role, would be an important and significant opportunity to break the usual pattern of casting Asians in minor roles.”With no ‘star-status’ attached to his name (a clause which allows a foreign star to recreate a role on Broadway without an open casting call) Pryce was initially banned from appearing. Although Mackintosh had led an extensive search to find an Asian actress to play Kim, no similar search had taken place for Pryce, and so the move was deemed to be a breach of equity rules. Mackintosh threatened to pull the show completely, saying the transfer would not happen without Pryce as the Engineer, and with a $24million advance and a potential loss of hundreds of jobs at stake, the ruling was revoked. Pryce went on to win the Tony Award for Best Actor in a musical. The original production team included director Nicolas Hytner (current director of the National Theatre), scenic designer John Napier , choreographer Bob Avian and costumes by Andreane Neofitou.